Friday, December 1 2017 (PANCAP Coordinating Unit, CARICOM Secretariat): The Pan Caribbean Partnership against HIV and AIDS (PANCAP), the mechanism that provides a structured and unified approach to the Caribbean’s response to the HIV epidemic, commends the Caribbean countries that received validation by the Pan American Health Organisation (PAHO) for the dual Elimination of Mother-To-Child Transmission of HIV and Syphilis. The countries are Anguilla, Antigua and Barbuda, Bermuda, Cayman Islands, Montserrat and Saint Kitts and Nevis. In 2015, Cuba made history when it became the first country in the world to have achieved the dual elimination of the Mother-to-Child Transmission of HIV and Syphilis (EMTCT). Since then a number of Caribbean countries and territories have prepared EMTCT reports and have applied to the PAHO Director for validation. 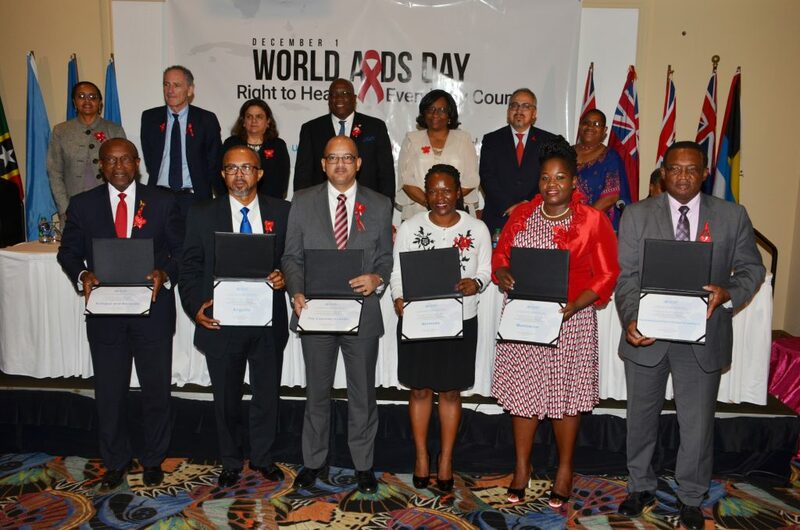 The announcement was made during a special ceremony hosted by Saint Kitts and Nevis, which included a feature address by the Prime Minister of Saint Kitts and Nevis, Lead Head for Human Resources, Health and HIV, CARICOM and Chair of PANCAP, the Right Honourable Timothy Harris. The Director of PAHO, Carissa F. Etienne also made remarks during the ceremony as well as Massimo Ghidinelli, Chief, HIV/AIDS Unit, PAHO, Dr Aida Oliver, Deputy Regional Director, UNICEF Office, Dr Cesar Nunez, Regional Director, Latin America and Caribbean, UNAIDS, Yolanda Simon, Regional Advocate for Persons Living with HIV and Merceline Dahl-Regis, Chair, Regional Validation Committee (RVC). In his message, Prime Minister Timothy Harris, stated that he was particularly proud of his country for achieving such a significant milestone since it meant that mothers and babies within the health care system are enjoying better health outcomes. He emphasized that Saint Kitts and Nevis is serious about remaining on the trajectory to end AIDS and that the announcement is an impetus for the Government and people of the country to work harder for the elimination of the disease. The Director of PAHO urged the representatives of the newly validated countries to think of the achievement as a next step rather than the culmination of the process. She explained that validated countries are due for revalidation every two years and countries must maintain a Mother-to-Child transmission rate of 1% or less in order to uphold their validation. Director of PANCAP, Mr Dereck Springer, reacted to the announcement by underscoring the significance of the achievement to achieving PANCAP’s vision of an AIDS-free Caribbean. He emphasized that the validation for EMTCT of HIV and Syphilis sends a strong message that the Caribbean is making remarkable progress towards achieving the goal of an AIDS-free generation and that this milestone directly aligns with the vision and objectives of PANCAP. The Director posited that the achievement signalled that the spread of the disease from mothers to children is being halted but implored that the process of maintaining EMTCT must be upheld by the countries who received validation. He also highlighted that the announcement will provide significant motivation for other Caribbean countries to accelerate their efforts to achieve elimination. “Certification is only a first step. We must now maintain this achievement and work to eliminate these diseases in other key population groups in the coming years to reach the end of these epidemics by 2030″ stated Mr Springer. The Director urged PANCAP member states to remain committed to the goal of EMTCT and embrace the Regional EMTCT Strategy and Plan of Action, which was renewed in 2016 in the ‘Plan of Action for the Prevention and Control of HIV and Sexually Transmitted Infections (2016-2021)”. An independent Regional Validation Committee (RVC) utilizing the global validation standards recommended by WHO led the validation review process.